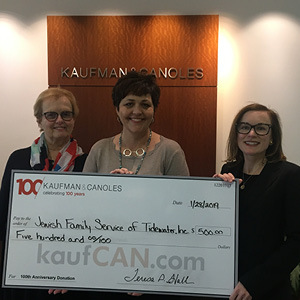 As part of its 100th Anniversary Giving Campaign, Kaufman & Canoles donated $500 to Jewish Family Service of Tidewater. Each week in 2019, the law firm’s employees are selecting a charity to receive the donation, and JFS was chosen as one of the initial recipients. Kelly Burroughs, JFS CEO, and Dorothy Salomonsky, director of the Personal Affairs Management (PAM) program, accepted the check for JFS from Mary Beth Sherwin, who nominated the agency. 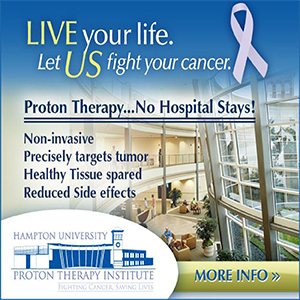 “Our mission at Kaufman & Canoles is to transform our community and the lives of our clients for the better. So, we’re celebrating our 100th anniversary by giving back,” says Sherwin. “I’m very honored and humbled to be part of such an amazing program and organization that is recognized for its hard work and dedication to people in our community who are often overlooked or marginalized,” says Burroughs.